Inventory We are a resale marketplace, not a box office or venue. Ticket prices may exceed face value. This site is not owned by Ellie Caulkins Opera House . The Ellie Caulkins Opera House is a part of the Newton Auditorium inside the massive Denver Performing Arts Complex. The Ellie Caulkins Opera House box office is located at 1101 13th Street in downtown Denver Colorado. The Denver Performing Arts Complex has hosted many of the hottest traveling Broadway shows in the country. DPAC tickets have included performances of the Book of Mormon, Wicked, the Lion King, Jersey Boys, Les Miserables, the West Side Story, and many more popular shows. 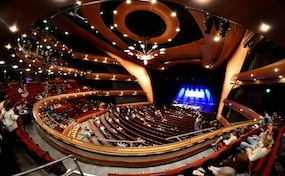 Ellie Caulkins Opera House opened in September of 2005 and has a seating capacity of 2,225. The naming came after a generous $7 million dollar pledge from the Caulkins family to renovate the opera house. OperaHouseDenver.com is not in any way affiliated with any official box office, venue, and or supplier. We are an independently owned and operated company that concentrates in all sales in the secondary ticket market. Prices may be well below or above face value and can change rapidly with market conditions. To order tickets to all Ellie Caulkins Opera House events simply follow the steps online or call our operators at all times.